Continuing education provider HomeCEUConnection.com announced today the release of over 40 hours of new video courses covering a wide range of helpful and insightful topics for physical and occupational therapy professionals. Our customers have come to expect courses that explore innovative new treatments and techniques, knowledge that they can start using right away. 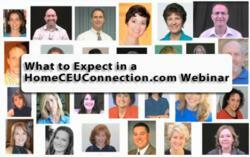 Rehabilitation professionals working in the field of physical and occupational therapy now have access to more than 40 contact hours of new continuing education video content in the HomeCEUConnection.com course catalog. The courses cover a wide range of relevant, up to date and thoroughly researched topics that provide immediate benefits to rehab professionals seeking to improve their knowledge base and skill sets. "Our customers have come to expect courses that explore innovative new treatments and techniques, knowledge that they can start using right away," states Anne Osborn, owner of HomeCEUConnection.com. "We're thrilled that we're not only able to meet their demands, but meet them quickly, thanks to the rapid development cycle we've been working so hard to perfect." Therapists specializing in pediatrics will receive instant benefits from Fundamentals for Childhood Occupations, Innovative Interventions to Treat Children on the Autism Spectrum and Solutions For Sensory Processing Disorders. For therapists seeking to expand their knowledge of issues affecting the geriatric population, HomeCEUConnection.com offers several new courses including Fibromyalgia and Myofascial Pain, Syndromes: Evidence-Based Functional Interventions and Examination, Geriatric Balance and Fall Prevention: Evidence-based Examinations and Interventions, and Rehabilitation for the Cardiac Impaired with an Adjunctive Look at the Vascular System. Other topics covered by these new video courses include Aphasia Treatment, Acquired Apraxia Treatment, Clinical Exercise Physiology, Manual Therapy for Instant Relief: Effective Techniques for Neck and Shoulder Dysfunction, and Dance For Physical Therapy. The new courses come from a list of highly qualified instructors, including Michelle Yoder, OTR/L, CIMI, Theresa Schmidt, DPT, MS, OCS, LMT, CEAS, CHY, DD, Lu Mueller-Kaul, LMT, MA, Karen Holtgrefe, DHS, PT, OCS, Bill Connors, CCC-SLP, Barbara A. Smith. M.S., O.T.R. and May Kesler, BS, MS, MA, MTh, PT. Topics covered are varied and diverse, appropriate for professionals in the fields of physical therapy and occupational therapy. All HomeCEUConnection.com courses offer relevant content and instant delivery of course certificates upon successful completion of an online exam. Rehab professionals can expect a superior experience on the website and from the friendly and knowledgeable staff as well as the peace of mind that comes from a strict triple verification system that ensures courses meet all relevant approval guidelines. A full list of the new courses can be found on the course catalog or on the HomeCEUConnection.com blog. HomeCEUConnection.com offers CEUs for Physical Therapists, Physical Therapist Assistants, Occupational Therapists, Occupational Therapist Assistants, Massage Therapists, Speech Language Pathologists, Athletic Trainers and Certified Strength and Conditioning Specialists that are convenient, affordable and user-friendly. We specialize in premium text and video based courses as well as live, interactive webinars that adhere to a strict triple-verification approvals process.